Pay now and stay for less than people who pay last minute. The pay in advance deal is valid up until 2 weeks before you stay. Enjoy the ideal family break with lots of exciting activities and entertainment to suit everyone, and free childcare that allows mum and dad some relaxation time. What more could you ask for? This hotel is doggy heaven, with miles of walks in the extensive estate for them to explore. They can stay in pet friendly accommodation and even accompany you when you go to the clubhouse for a bite to eat. 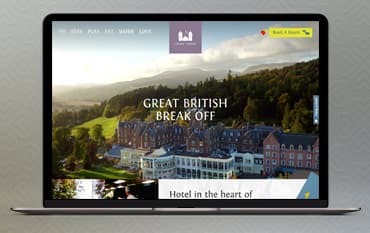 Where do I use my Crieff Hydro Hotel voucher code? Choose a code on NetVoucherCodes and copy it, follow the link to Crieff Hydro Hotel website. Click book a room and select the date of your stay and the accommodation type you would like. You will then be taken to a page with availability and room type available. Select which room suits you best and click “Book Now”. You will be taken to the guests and extras page where you can enter your discount code at the top of the page. Enter your code and click apply. Any discounts will automatically be updated and displayed in the price on the right-hand side of the page. "Enjoy great discounts in the special offers section." Few hotels can match the pedigree of the luxurious Crieff Hydro Hotel in Perthshire. Established in 1868 by noted physician Thomas H. Meikle, from the very start the Crieff Hydro has sought to offer the finest in leisure and relaxation - a history reflected in its beautiful Victorian spa, the spa and sauna treatment therapies available to guests, and the spacious indoor pools for children and adults alike. It’s not all just poolside pampering either - with plentiful outdoor activities including an air rifle range, horse riding, off-road driving, climbing and quad biking, the more energetic will have plenty to entertain them in and around the Hydro grounds. Stay in the hotel and select a room from the standard to the sumptuous and enjoy award-winning dining in the restaurant and brasserie, or reserve one of their lodges, cottages or chalets with self-catering options. The Hydro is also happy to host your special occasions like weddings and christenings, as well as provide solutions to businesses looking for delegate packages, conferences or team-building exercises. At Crieff Hydro, there are 55-holiday homes to choose from including cottages, lodges, and apartments. There is plenty of room for the whole family whatever the size so there is no need to worry about space. With the 5-star luxury accommodation available, large groups are always merrier in the five-star holiday homes at Crieff Hydro which can fit up to 16 people. The home from home facilities allows you that extra reassurance and comfort meaning you don't have to pack your life away with you. Across the 900 acres, you can be in the heart of the action just outside the Crieff Hydro hotel, or tucked away in peaceful Scottish woodlands. Choose your exact preferences and you are sure to have that break away from home to remember. At Crieff Hydro, ‘Spa’ means two things. The exquisite Victorian spa pool & the tempting spa beauty treatments. The terrific pools at Crieff Hydro are heated to the perfect relaxing temperature as are the sauna, steam room, and spa bath. You can indulge in a sensational 2-hour session of pure heaven and choose from various convenient time slots that will suit you. You can also enjoy the fabulous new touches at Crieff Hydro, including robes, upgraded steam room, and ice experience. Fancy a pre-breakfast dip or a pre dinner swim? Just head down to the leisure desk as there is no need to book between 9am and 6:30pm. if you’re heading off out or in need of a quick bit of pampering for a special occasion, then book yourself in for that pedicure, manicure and colour touch up you've been promising yourself! But there is no need to stop there. Indulge in some much needed me time with a hot stone massage, facial or even a full detox! Book online now and start relaxing at Crieff Hydro. Your time in the Scottish Highlands is bound to fly by quicker than you can imagine, so it’s best to start planning your visit now. If you’re looking for things to do on your Scottish holiday, you won’t be stuck for choice as there are over 60 activities to chose from. From horse riding, water walking, mountain biking & banana boating! Something for everyone’s taste is available and the easy to navigate site gives you all the info you need to start your planning now. Whatever your age and preference you are sure to find something fun and affordable to make your time at Crieff Hydro extra special. You have come to right place if Golf is your game! The Culcrieff Golf Club at Crieff Hydro is considered one of the best in Scotland so if you're looking for a golf break in the Highlands, then you have certainly found your destination. Set in the Strathearn Valley, enjoy the challenging course of 18 holes. Soak up the atmosphere whilst you play with views of Ben Vorlich and Ben more and finish up with the downhill par three of 212 yards on the 18th hole. The perfect end to a perfect round. Come and see for yourself. With Crieff Hydro's self-catering holidays, you can revel in the little things like the fabulous on-site activities and friendly team on hand dedicated to catering for your every need. Free childcare is available when you stay at any of the self-catering cabins, lodges, and apartments, where they can enjoy over 60 activities which will keep them occupied whatever their taste in play! Crieff Hydro want you to enjoy yourself just the way you like. A multitude of outdoor pursuits are available and why not bring your dog along too, with 900 acres of estate to enjoy. There is a self-catering short break to suit everybody at Crieff Hydro - so make sure you check out our Crieff Hydro Hotel deals before you book. What does the free childcare include? You get two free sessions of BIG country childcare for 2-12-year-olds per day when you book with Crieff Hydro. Yes! However, there is a cleaning supplement for your dogs stay and only 2 dogs are allowed. All rooms are equipped with a safe, a hairdryer, a TV and an iron and an ironing board. Executive rooms, signature rooms and self-accommodation have additional things included too. Your room will be ready for check-in between 3pm-5pm. Check out is at 11 am on departure day. When hotel’s claim they have ‘something for everyone’, it can sometimes be misleading, but at Crieff Hydro, it’s just something that happens to be true. Banish those stereotypes of a standard hotel and enjoy the luxurious, unique Crieff Hydro, you won’t be disappointed. You will feel completely at home and can revel in luxury touches combined with practicality. From standard family rooms to the scrumptious, signature studios, everyone's taste can be kept in check. Choose from luxury self catering accommodation with home from home amenities. We are constantly on the hunt for Discount Codes for Crieff Hydro Hotel to help you with your money saving. Our experts check dozens of sites for secret codes including NHS discounts, student sites & social media channels saving you time & money!